I still remember googling that phrase 7 months ago. Baby Bird was just starting to look around and notice things on her own and being a first time mom I wasn’t sure if it was time to pull out the Monopoly game or not. Just kidding – but I did Google that phrase! 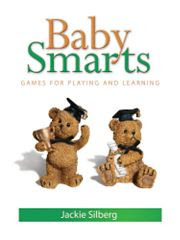 Baby Smarts – Games for Playing and Learning is a Gryphon House book for the first year of your little one’s life and is split into four chapters, each representing a three-month period. It is written by Jackie Silberg, an expert in child development. She’s written 15 books including Games to Play With Babies and 125 Brain Games for Babies. Each chapter begins with a developmental chart that lists various physical, social and intellectual milestones to look out for. Then it lists the various games you can try out to help your little one develop some of their new found skills. The games list the developmental milestone it is working on followed by how to play in point form. Which is good for me because as soon as Baby Bird sees me pick up the book, she is crawling over to get it into her mouth. I can read a game quickly and put it down and start playing by the time she has crossed the room to see me. Baby Bird is 11 months old and some of her favorite games right now are Bang on the Drum, Here Comes the Ball, In and Out and Funny Things. We are working on Wipe Your Face right now as well. The only game that didn’t go over well was the Hat Game. It took me a week to convince her that she needs to keep her hat on when we go outside after that game. It was an easy fix though…I finally just played the game in reverse and instead of having her take the hat off, I started asking her to put it on. This is a great book to have on hand for those times that you aren’t sure what to do next. Even now, the days can be long and as I am sitting here watching baby Bird do her tenth lap around the living room thinking “What can I do now?”, it is nice to have a resource that I can quickly refer to that will remind me of what I can try next. Looks like a really cool book! I could use it. I would have loved this for when Chicken was younger! Now I would like to give it to my SIL who is preggo with number one! This would be so helpful. What an awesome idea for a book! Great Book idea. I have lots of nephews and it can be hard to find "games" to play when they are little.